This original work of art is a cross between a painting and a sculpture. The wooden board has organic shaped cut outs through which you can see the wall behind. 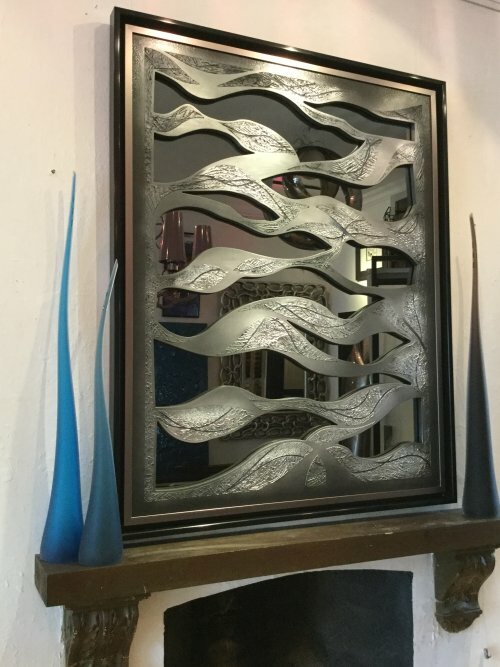 This piece features a double frame, in pewter and black. The textures and relief of the work suggests a hand finished metal, with a metallic silver and pewter finish. Other neutral colours, like brown and black subtly add some interest. This work can be displayed landscape or portrait. In addition it has a grey mirror at the back showing through the cut outs, making it stunning!